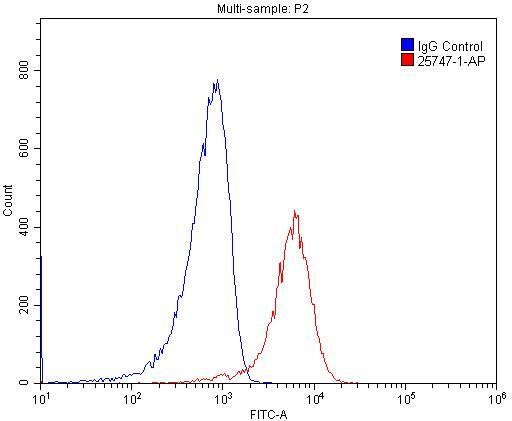 IP Result of anti-CD68 (IP:25747-1-AP, 4ug; Detection:25747-1-AP 1:300) with RAW 264.7 cells lysate 1200ug. 1X10^6 RAW 264.7 cells were stained with 0.2ug CD68 antibody (25747-1-AP, red) and control antibody (blue). Fixed with 4% PFA blocked with 3% BSA (30 min). Alexa Fluor 488-conjugated AffiniPure Goat Anti-Rabbit IgG(H+L) with dilution 1:1500. 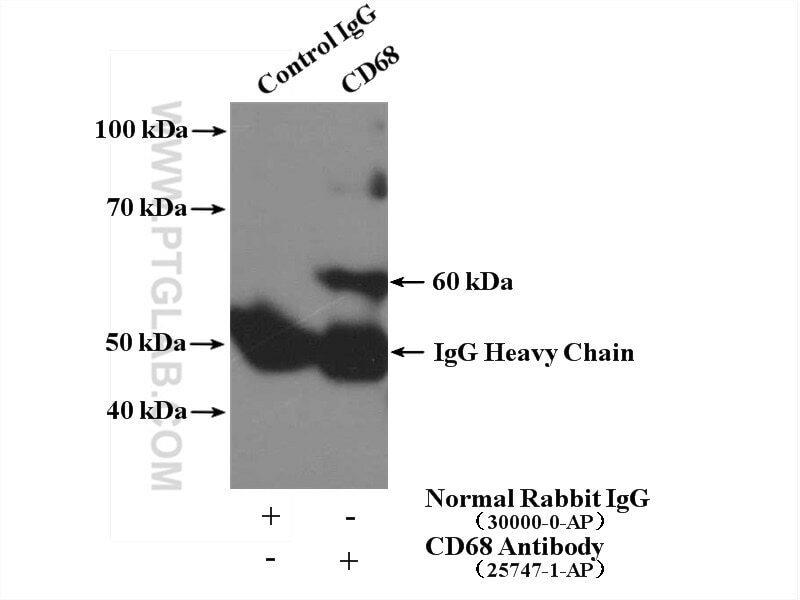 CD68 is a type I transmembrane glycoprotein that is highly expressed by human monocytes and tissue macrophages. It belongs to the lysosomal/endosomal-associated membrane glycoprotein (LAMP) family and primarily localizes to lysosomes and endosomes with a smaller fraction circulating to the cell surface. CD68 is also a member of the scavenger receptor family. It may play a role in phagocytic activities of tissue macrophages. The apparent molecular weight of CD68 is larger than calculated molecular weight due to post-translation modification. Figure 1. IF of CD68 (red) in human spleen. Formalin-fixed paraffin-embedded human spleen tissue was used as positive control to probe for CD68. Heat-induced antigen retrieval was performed in sodium citrate buffer pH 6.0 + Tween20 at 0.5%. Tissue incubated at 96*C for 20 min inside the buffer. Permeabilization was done with washes of TBSTritonX 0.25% for 3x 5min and blocking was done in TBS 10% Goat serum, 1% BSA, for 1 hr at RT. Anti-CD68 was used at 1:200 in blocking buffer, overnight incubation at 4*C. Secondary antibody AlexaFluor 488 was used at 1:500 for 1 hr at RT. Imaged using a Nikon A1 confocal microscope. Figure 2: CD68 (red) and CD206 (green) in human primary macrophages polarized to M2-phenotype, encapsulated in 3D hydrogel (hyaluronic acid and collagen type 1). Staining was performed as described above, except primary (CD68) was used at 1:100 and secondary antibodies were used at 1:500. Disruption of TGF-β signaling in smooth muscle cell prevents elastase-induced abdominal aortic aneurysm. Disruption of TGF-β signaling in smooth muscle cell prevents flow-induced vascular remodeling. Interleukin 6 receptor is an independent prognostic factor and a potential therapeutic target of ovarian cancer. Indoleamine 2,3-dioxygenase expression in human inflammatory bowel disease. Neuronal phagocytosis by inflammatory macrophages in ALS spinal cord: inhibition of inflammation by resolvin D1.